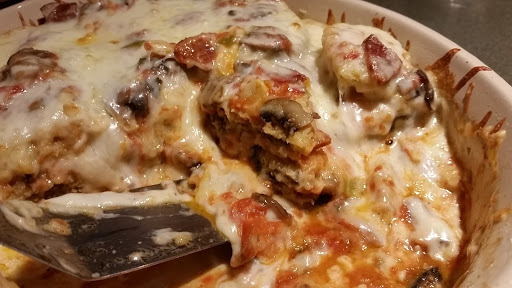 Parmigiana is the best kind of comfort food. It’s something crisp and breaded covered with tomato sauce and cheese. I do this same dish with veal or chicken cutlets, with green tomatoes or summer squash, but the absolute best is eggplant. I pretty much like any eggplant dish; stir fries, Indian or Thai curries, baked eggplant, fried eggplant, you name it. Late summer brings the largest, and the last garden eggplant harvests. I was fortunate to be visiting my parents at a time when the plants were heavy with fruits, and so I harvested six white and purple eggplants just a bit larger than my fist. You can make this dish with any kind of eggplant, but I find that the ones that are just smaller than a softball are the best. Begin the prep by slicing off the stem end and the blossom end. Then peel the eggplant. It is not necessary to peel, it is just a personal preference. 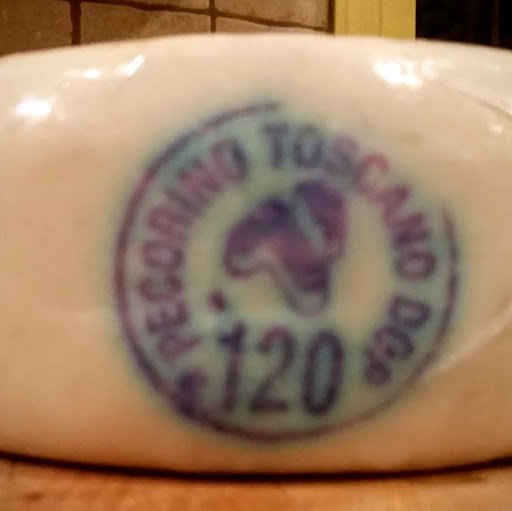 Many dishes I leave the skin on, but for parmigiana, I like it peeled. Slice the eggplant about 3/8 to ½” thick. Generously salt the slices and stack on a deep dish to allow them to drain for at least 30 minutes. Then rinse off the salt and pat the slices dry. This salting collapses the cell structure of the flesh and prevents the eggplant from taking up too much oil in the cooking process. This is particularly important if you are going to fry the eggplant. If you fry and skip the salting step, the eggplant will soak up cooking oil like a sponge….not what you want. Next, prepare three bowls for coating the eggplant slices. The first is ½ cup flour seasoned with a little fresh ground black pepper (the eggplant was already salted). Next is four eggs beaten until smooth. Last is about 2 cups of panko bread crumbs moistened with 2T good olive oil. 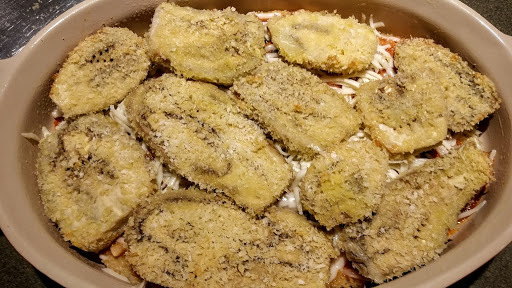 The reason for the olive oil in the crumbs is that the eggplant slices will be baked to crisp them up a bit before assembling the final dish. 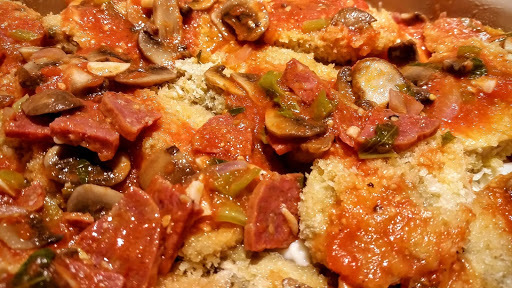 Lightly oil a half sheet pan and arrange the breaded eggplant slices on the pan. It’s ok if they overlap a bit. Place the pan in a 325F convection oven. Bake until the eggplant begins to brown, and feels slightly crisp to the touch. This is about 30 minutes. In the meantime, prep your sauce. You can make the sauce however you want, and vary the ingredients to your preferences. 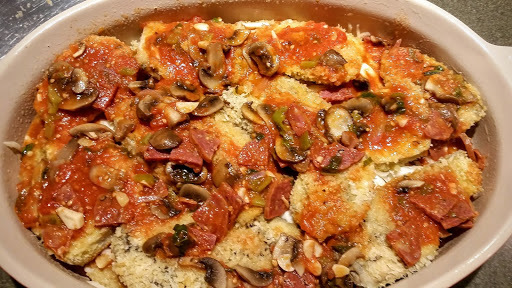 I start with about eight cloves of garlic minced, one green chile (like an Anaheim) seeded and finely diced, 1-1/2 cups thinly sliced Crimini mushrooms, 2T diced onion, and about ½ cup of thinly sliced Calabrese salami. Heat 2 T olive oil in a sauté pan. Over medium heat, cook all of these ingredients until tender and just starting to brown. Then I take a quart jar of my home canned San Marzano tomatoes and chop them a bit with a stick blender. I do this right in the jar. Pour the tomatoes into the pan and heat until it bubbles. Reduce the heat to low. Finish the sauce with about 2T minced fresh basil leaves and some black pepper. Check on your baking eggplant. It should be ready to go. Lightly oil a casserole pan. I prefer one that is large and shallow. I use a gratin pan for this. Lightly coat the bottom of the pan with a bit of the tomato sauce. Layer the sauce with slices of baked eggplant. 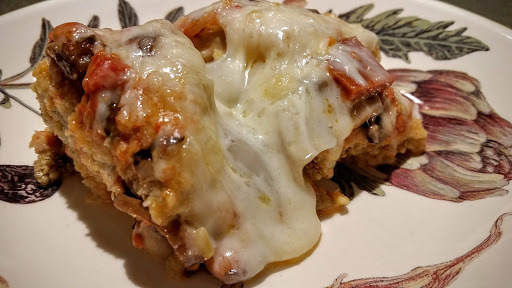 Put a dollop of sauce on each eggplant slice, then top the layer with grated cheese. I used mozzarella and DOP Pecorino Toscano for this version. You can use whatever cheese you like. Goat cheese is good, as is ricotta. 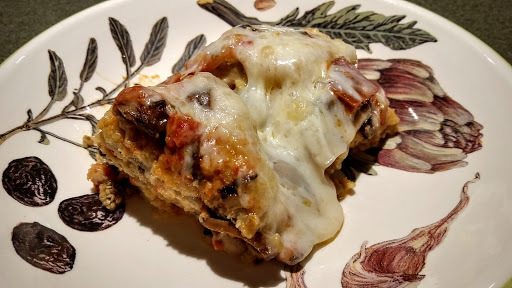 Layer with eggplant, sauce and cheese. And then one more layer should use up the rest of the eggplant and sauce. Top with cheese. Bake in 325F oven until the top begins to brown and gets bubbly. This is usually about 30 minutes since the sauce and eggplant were already hot. Allow the casserole to sit out of the oven for 10-15 minutes if you can stand it. Then cut and serve with a metal spatula. I like to sprinkle mine with some smoked red chile flakes. You can make your own by smoking some of the red chile flakes you would typically use on pizza. Store them in a jar with a lid. We go through a lot of these at our house!